Final results have been posted and we have photos available from this past weekend’s Lookout Mountain 50 miler & 10k trail race, presented by Vasque Project & Rock/Creek. If you haven’t already heard, we had to cut the course short due to the severe weather, and we ended up changing the proposed 100k to a 50 miler. 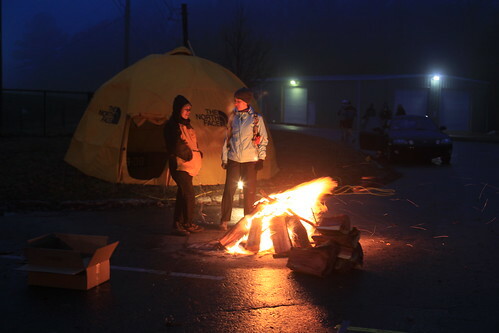 Wind, rain, and occasional sleet couldn’t stop the 65 finishers in the 50 mile race [click here for Lookout Mountain 50 miler results]. With 172 people finishing this year, the 10k proved to be a great course. 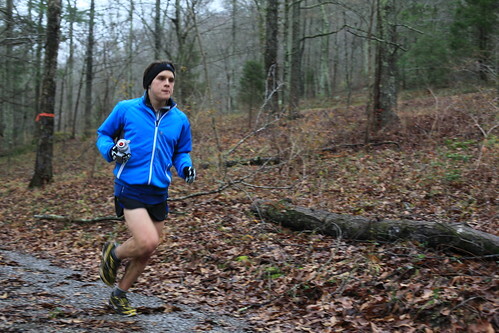 See the results for the Lookout Mountain 10k here. See photos from Moncrief Photography for the 10k and McKnight Photography for the 100k. We had big plans for the 2nd Annual Lookout Mountain 100k/10k, but Mother nature stepped in and let us know she had plans of her own. The week leading up to the event was wet, and the day before the race, Friday, the critical trail marking day, rain poured out of the sky until 4:00. Sections of the course were completely underwater and the forecast called for rain starting at noon on Saturday, temperatures dropping from a high of 45 to below freezing and snow flurries as well. Midday Friday we started talking about changing the course so runners wouldn’t be traversing the hairiest, scariest section after dark in the slick, icy, possibly snow laden nighttime. With runner safety in mind, as well as an effort to protect one of the valued tracts of land we are fortunate enough to get to use, we settled on moving the venue from Lula Lake Land Trust to Covenant College, at the top of Lookout Mountain and cutting the course to a 50 miler. Seventy-four runners showed up at the start line for the scaled down version of the race, ready for whatever came their way. They started off in heavy fog, with visibility approximately 10 feet. The flagging was hard to see but everyone made it along the bluff line to the north end and around the front of Lookout Mountain to the first aid station at Craven’s house in the Chattanooga and Chickamauga National Battlefield Park without incident. They then dropped to the base of the mountain to the scenic Reflection Riding Center where the bulk of the water from the week of rain had collected. The entire lower portion of trail (as well as the access road) was underwater so the course had been rerouted to higher ground. Josh Wheeler, 22, originally from Signal Mountain, TN ran comfortably in the lead to this point and through the riding center with Byron Backer shadowing him, but by the time they had completed the four miles of climb over an eight mile section back to the top of Lookout Mountain Josh had a 13 minute lead which grew over the remaining miles. In the women’s race, Laura Kloepper came into mile 23 (Covenant College or base camp) ahead of Jenny Chow, last year’s 100k winner, but by Lula Lake Land Trust, Jenny had a 2 minute lead. Both women came in looking fresh and relaxed, and on their second time through, Jenny had built her lead to 10 minutes. When Josh came back through Lula Lake at mile 42.5, he was enjoying a little walking break with his brother Jake before he took off again to secure his 6:52 finish. Byron finished first master’s male and fourth overall. Wind gusts sent the tents at base camp into the air a few times and volunteers scurrying for cover. We did have some drizzle and some flurries, but the aid stations off the top of the mountain were spared the howling wind. In fact, it was really nearly balmy, with the temperatures holding at about 36 degrees. Lula Lake Trust was the favored site for many visitors including Sean “the shotgun” Blanton. He downed a Southpaw Light on his way out of the aid station (at 29.9) and came back through and then shotguned a Schlitz Malt Liquor 16 ounce (at 42.5). He did go on to finish. The change of venue also required a new course for the 10k. The 172 runners who showed up to brave the course certainly faced a challenge. The new course utilized several trails in the college’s cross country park as well as some multi-use trail outside the park. Sawmill, a multi-use trail feeds into a powerline access road for a steep, muddy, and slick climb out and up to the finish line. Sam Dech, 30, of Oklahoma City ran an impressive 38:01 and Whitney Medlin, 23, of Homewood, Alabama, was first female in 48:30. Big thanks go out to all the sponsors, Rock/Creek, Vasque PROJECT, SmartWool, The North Face, Marmot, Salomon and Hammer Nutrition. Also thanks to all the volunteers who generously offered their time and talent, and the runners for sticking it out on a tough day and rolling with the changes we had to make.